Monmouth Conservatory of Music has now opened enrollment for Classical and Flamenco guitar lessons with Patrick Appello. Mr. Appello was formerly on the music faculty at Georgian Court University and has many years of teaching experience. He’s also an accomplished performer, and has served on audition panels and juries. Mr. Appello’s students will be eligible for the guitar ensembles. Lessons are by appointment only Tuesday to Saturday between 3:30 and 7. The Guitar Ensemble meets Thursdays at 6. You're listening to Patrick play Liebesbothschaft, composed by Franz Schubert and arranged by Johann Kaspar Mertz circa 1840. Patrick is performing on an 1846 Lacote guitar from the Augustine collection. This recording appears on Patrick's CD, The Last Rose of Summer. Follow the links for information about Patrick's upcoming appearances as well as a biography, photos and more. Patrick is available for engagements in the tri-state area. "The music - some familiar, some quite unfamiliar, illustrates the untapped riches available to an artist willing to seek them out." "And all of it is played with skill and sensitivity. 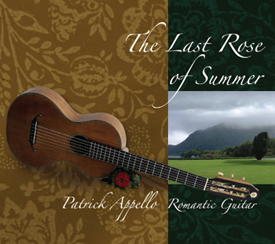 Patrick Appello's artistry is evident throughout."